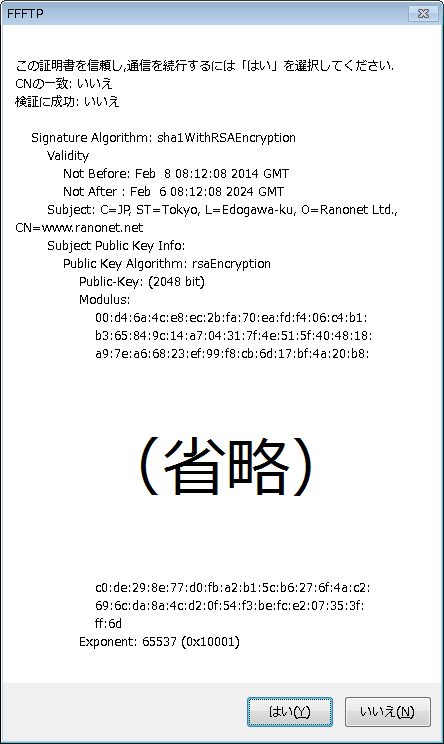 Organization Name (eg, company) [Default Company Ltd]:Ranonet Ltd.
FTP over Implicit SSL/TLS (FTPIS)を使用します. FTP over Explicit SSL/TLS (FTPES)を使用します. 200 PBSZ set to 0. 200 Always in UTF8 mode. 200 Switching to ASCII mode. 227 Entering Passive Mode (192,168,0,79,25,179).